You bring the pictures and videos, we’ll bring the music and filters! Download the best video app to share your favorite moments. Everyone has a story to tell, be it grand adventures or the little moments that make up each day. At Flipagram, we celebrate them all. Become the director of your life’s best moments with just a few taps of your smartphone. 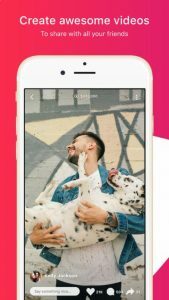 With Flipagram’s easy to use editing tools, awesome filters and effects, and access to today’s best music, you can be creating and sharing videos in no time. Add your favorite music to your movies and slideshows for free – with millions of tracks from top artists to choose from! Check out our music filters and effects, where music beats can affect how the filters interact with the video or slideshow. We constantly update our filters so you can be creative with every creation! Find great content ranging from comedy, cooking, makeup, pets and more from our network of talented makers! Share your videos and slideshows to our members to become a star!